Tracy Electric offers complete unit repair, new unit sales, redesign, 24 hour emergency service and free estimates. We have the most complete selection of new equipment and parts in the area. We offer complete in house fabrication services for your custom ductwork needs. On site measuring and installation services are available by our qualified technicians. If you can dream it, we can build it. A preventative maintenance agreement can save you money on your electric and gas bills. A deficiency of only 20% in indoor air flow reduces the SEER rating by 17%. A 15% return air leak from a 120 degree attic could reduce a 12 SEER to a 6 SEER. A 23% refrigerant undercharge could result in a 52% efficiency loss. 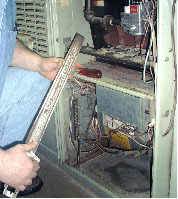 A build-up of .042 inches of dirt on a heating or cooling coil can result in a decrease in efficiency of 21%. Tracy Electric will wash out the AC unit, oil motors and check belts, refrigerant pressures, burners, vent pipe, heat anticipator and filter. Call us today for your custom tailored preventative maintenance program. For years, smart home owners all over the world have been discovering the advantages of heating and cooling with geothermal energy. No matter where you live, the underground temperature stays relatively constant all year, even though outdoor temperatures vary widely. Geothermal systems harness the relatively constant, renewable energy source, and use it for heating, air conditioning and hot water. Geothermal systems circulate a water based solution through a loop of small diameter underground pipes. When heating, this solution absorbs heat from the earth and carries it to the geothermal unit, which compresses the extracted heat to a high temperature and delivers it to your home. When cooling, the process is simply reversed, and the resulting cool, dehumidified air is delivered to your home. In some locations, well water is used, replacing the closed loop system. Operates more efficiently than ordinary heating and air conditioning systems, saving up to 60% in most cases. No flame, no flue, no odors, and no danger of fire or carbon monoxide. High efficiency filters remove dust and pollens to improve indoor air quality. 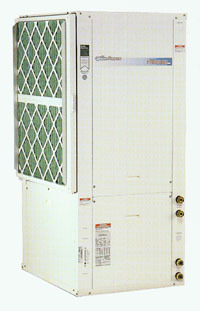 Tracy Electric is a factory-trained dealer for the WaterFurnace geothermal system.